In the first years of the 20th century well-heeled gentlemen purchased their clothing from custom makers, each specializing in an item--hats, shirts, gloves or suits, for instance. The quality of their products was reflected in high prices--prices which amassed fortunes for the manufacturers and enabled them to erect handsome buildings. In 1902, for instance, the Beaux Arts style Knox Hat Building was completed on Fifth Avenue and 40th Street, and the same year shirt makers Kaskel & Kaskel erected its marble retail palace on the Fifth Avenue corner of 32nd Street. 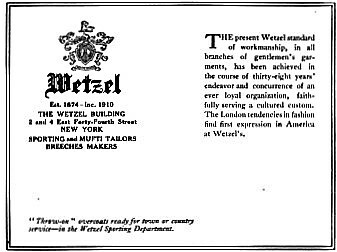 Preeminent among the men's tailors was Wetzel (whose labels announced "Wetzel of New York"), founded in 1874. 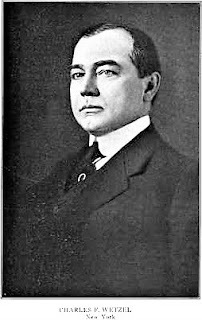 Charles F. Wetzel was described by Advanced Fashions in 1911 as "a merchant with a reputation world wide" and "an advanced thinker in the tailoring world." Wetzel, too, was located on Fifth Avenue. At the time of the construction of the Knox and Kaskel & Kaskel structures he was leasing the building at the eastern corner of 34th Street. But that was about to change. A big mercantile firm wanted to put up a department store there and it had to let Wetzel name his price, he named it and the firm paid it. Charles Wetzel sold his lease for $200,000--nearly $5.7 million today. The Times went on, "With the proceeds together with the considerable wealth he had already accumulated, the tailor was able to buy the Forty-fourth Street plot." That plot engulfed Nos. 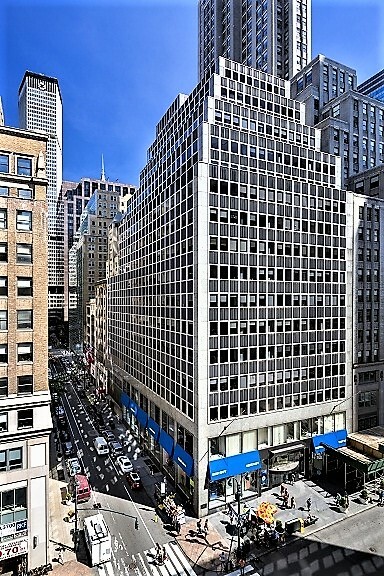 2 and 4 East 44th Street, steps from Fifth Avenue and across the street from the fashionable Delmonico's. Wetzel put the architectural firm of Hill & Stout to work designing a building for his business, including showrooms appropriate for his millionaire patrons. They did not disappoint. Plans were filed in December 1904 for a five-story "loft and office building" to cost $100,000. Construction began in February 1905 and the 45-foot wide building was completed within the year. Normally architects published renderings of their structures early on in the process; but Charles F. Wetzel seems to have had a sense of drama. During most of the construction the building was kept hidden behind a high wooden fence. When it was taken down, enough of the structure was already completed to create an impact on the press. 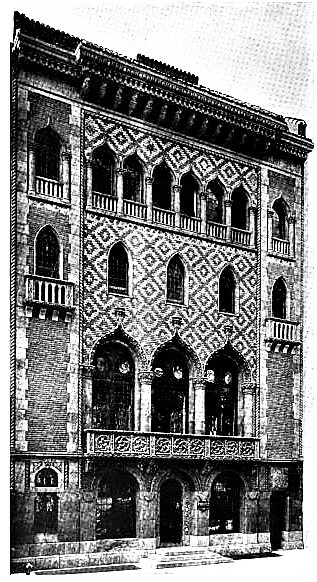 On August 3, 1905 The New York Times reported "Wetzel, the tailor, unveiled his new Venetian building on Forty-fourth Street yesterday...The structure is a distinctly artistic addition to the neighborhood. There is nothing else in New York quite like it, the soft mingling of rich colors presenting a pleasant contrast to the solid stone buildings near by." 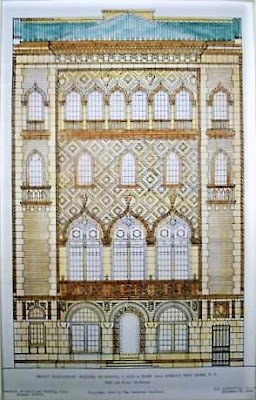 On the same day The Real Estate Record & Builders' Guide said "When the facade of the new Wetzel building...was uncovered by the workmen this week one of the prettiest pieces of architecture in the city was disclosed." 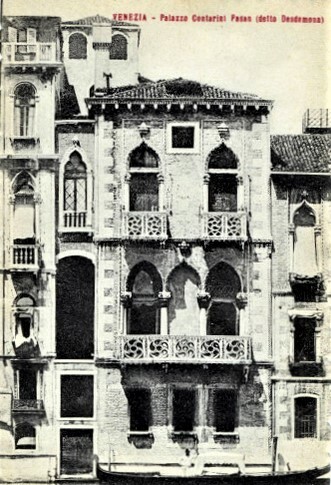 The article called it "the first real example of the true Venetian we have yet obtained." Indeed, Hill & Stout had drawn inspiration from the 14th and 15th century palazzi that lined the Grand Canal of Venice--most notably the Palazzo Contarini Fasa, traditionally the home of Shakespeare's Desdemona. 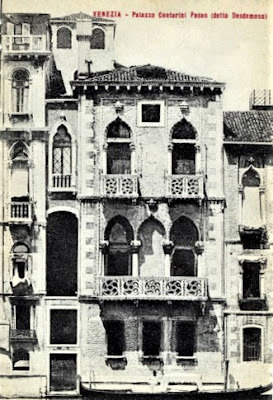 A postcard depicting the Venetian Palazzo Contarini Fasa published at about the same time of the Wentzel Building's construction reveals marked similarities. Clad in brick, granite and terra cotta, the facade's design elements included lancet arches, Juliette balconies, and arcades. Expert masons had executed a tapestry of diamond-pattern brick. A deeply overhanging cornice upheld by carved wooden supports introduced the vivid blue-tiled roof. The Record & Guide's writer applauded Wetzel, saying he was "evidently a gentleman of both fine taste and wealth;" while crediting Frederick P. Hill for the polychromatic design. "Mr. Hill is evidently a colorist. 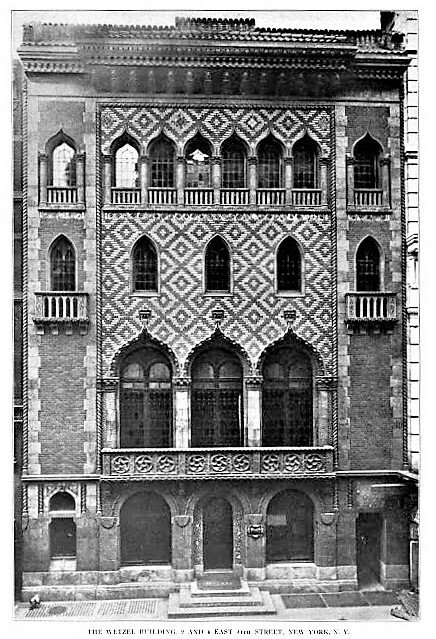 His modeling is rugged and simple, as the character has been put into the masses rather than into the detail...In this Wetzel building, old chromes and soft reds are enlivened by old greens and blues, and taken with the graceful forms employed there is presented a very characteristic Venetian building." Hill & Stout set the commercial building apart from almost all others by designing it to appear entirely residential. There were no show windows, no signage (as a matter of fact, the Record & Guide stressed "It certainly will not be disfigured by a signboard.") Men with the money to shop at Wetzel did not need a sign--they knew where they were going. The interiors were no less striking. Wetzel's customers entered a reception room deserving of a doge's palace. Under a groined ceiling antique Italian furniture sat on a tiled floor. 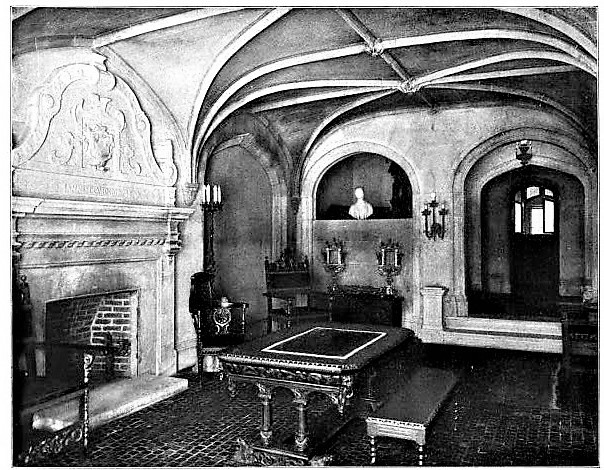 A massive wood-burning fireplace and mantelpiece dominated one wall. If they were impressed by the reception room, customers would be awed by the salesroom. The elaborate plaster ceiling hinted at fan-vaulting and dripped electric light bulbs. Offices at the mezzanine level faced a gallery with a wooden filigree railing that included a carved coat of arms. Here, surrounded by polished chestnut woodwork, the wealthy customer met with Charles Wetzel. Well-dressed clerks brought in bolts of the best fabrics from which to choose. Otherwise, there was no hint that this was a clothing establishment. Hill & Stout took enormous effort to create the illusion that the client was in antique surroundings. 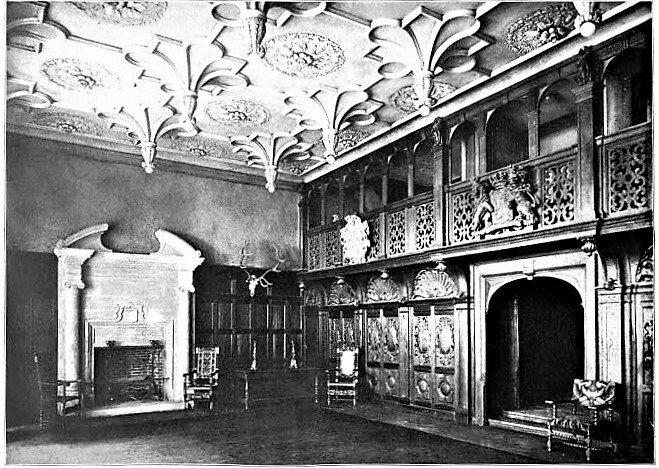 The Record & Guide described the paneling of the salesroom: "In the beautifully carved panels is the prized color tones of the good old wood, the time-softened outlines, wrinkled surfaces, and worn edges, as if Father Time, sythe [sic] in hand, had gone over the work when the modern artisan had laid down his tools." The effect was produced by sand-blasting the panels after carving. The article explained "The architect of the building personally directed the unique operation in the Wetzel Building, which put, so to speak, three hundred years into a day's time." Around 30 expert tailors worked in the upper floors. Wetzel's advertisements boasted that he satisfied the tastes of "the best-dressed male in the world." Like his moneyed customers he disdained fads and for decades purveying only British-approved fashions and slight variances on tradition. Charles Wetzel leased space in the upper floors. In 1913 F. E. Bebus moved in his optician's office; and by 1914 Hanson Studios was in the building. The settlement movement had began in the mid 1880's; an effort to provide instruction, daycare, and medical attention to the impoverished neighborhoods. Among the earliest in New York City was the Union Settlement. In 1915 Hanson Studios staged a benefit for the facility. On December 19 the New-York Tribune reported "A special exhibition and sale of baskets, rugs and other articles made in the Union Settlement workrooms will be continued through the week at Hanson Studios, 4 East Forty-fourth Street. Through the workrooms families in the settlement neighborhood formerly dependent have been helped to self-support. Much of the work has been done by Italians." By the time of that sale the majority of Wetzel's millionaire patrons had moved northward along Central Park. The formerly exclusive residential neighborhood was becoming increasingly commercial. Wetzel and Hanson Studios would both leave the building in 1917. In September that year the Harriman National Bank, which adjoined the building on the southeast corner of Fifth Avenue, leased the ground floor. 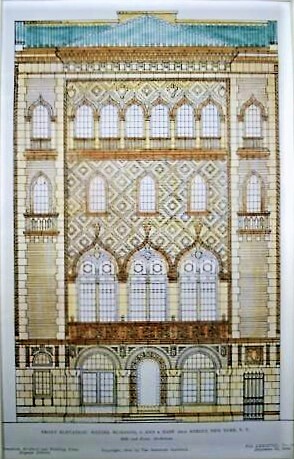 Hill & Stout's magnificent Venetian Gothic interiors made way for bank offices. In 1929 the masterful Venetian Gothic Wetzel Building was demolished. Today its site is included in the late 1950's, 19-story 529 Fifth Avenue building.